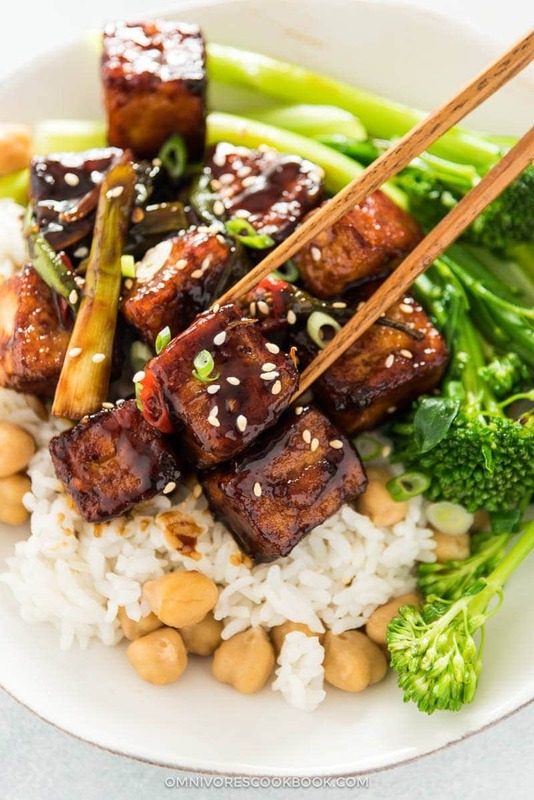 In Chinese cooking, using fried tofu is one of the best ways to replace meat and create scrumptious vegetarian dishes. 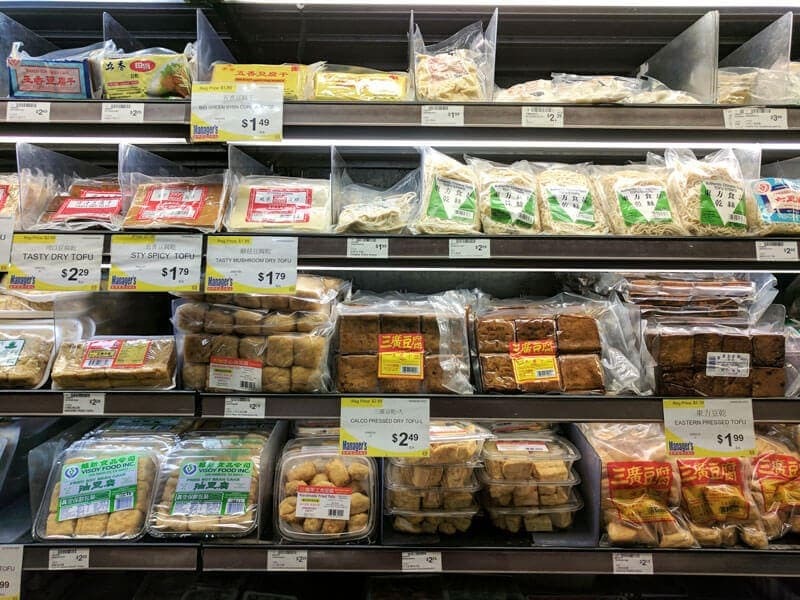 If you walk down the aisle of a Chinese supermarket or a good Asian grocery store in the US, you’ll see numerous soybean products lined up on the shelves, almost as many as the cereal brands in the US. Even for fried tofu, there are different types such as “mock chicken” and “mock duck”. These tofu products are pre-seasoned, which adds tons of flavor to a vegetarian dish. Living in Austin Texas, tofu products have become a luxury. I rarely see the variety in the Asian market, besides normal tofu. So, I started to experiment with fresh tofu and managed to find a great way to create crispy tofu that is just as good as fried tofu! It tastes so great even served by itself, with a sprinkle of salt and pepper. 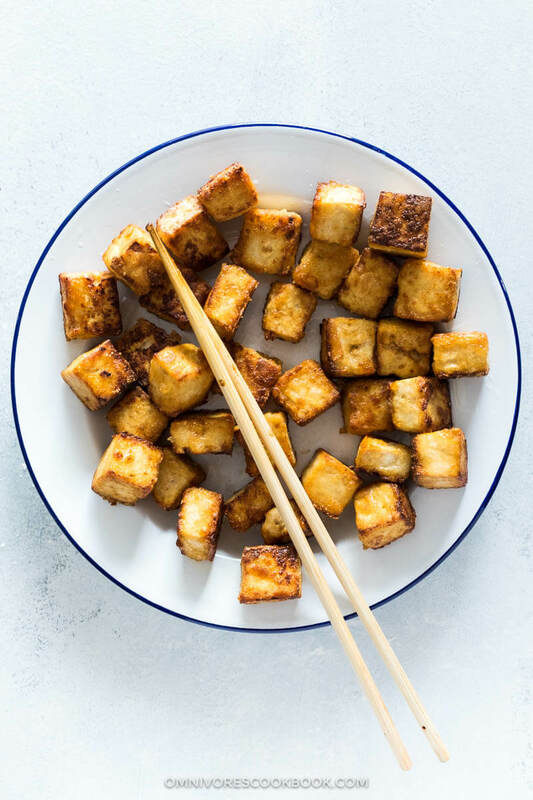 With a simple stir fry sauce, the crispy tofu will make an amazing vegetarian stir fried dish by replacing the meat in the dish. Cut tofu into 1-inch chunks and transfer to a gallon ziploc bag. Marinate the tofu with soy sauce and and a bit syrup. This helps crisp up the tofu and gives it a beautiful color. Drain all the liquid. Add cornstarch into the bag, shake to coat. 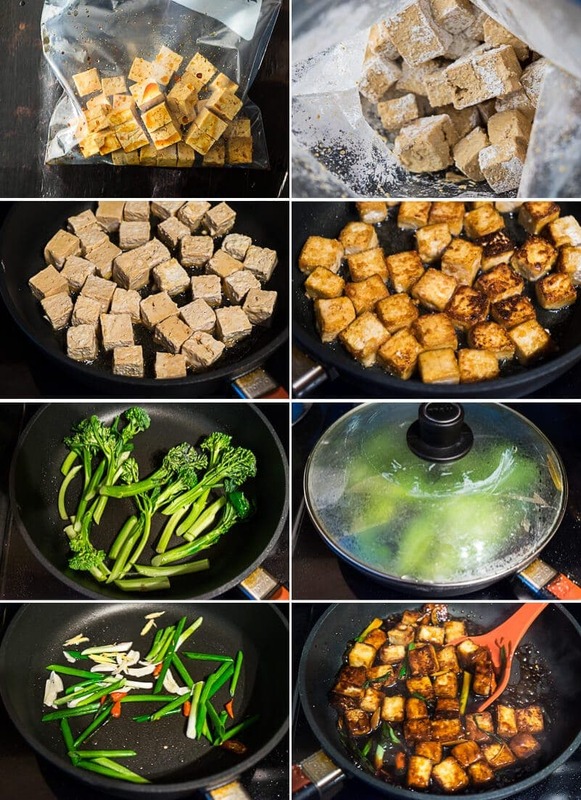 Brown tofu with 2 tablespoons oil in a large pan. Don’t worry that the tofu will break apart, as long as you’re using extra firm tofu and handle the bag gently. 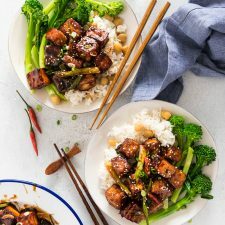 So far this is the fastest way I have found to cook crispy tofu that has the perfect texture, and that won’t make a mess on your kitchen counter. 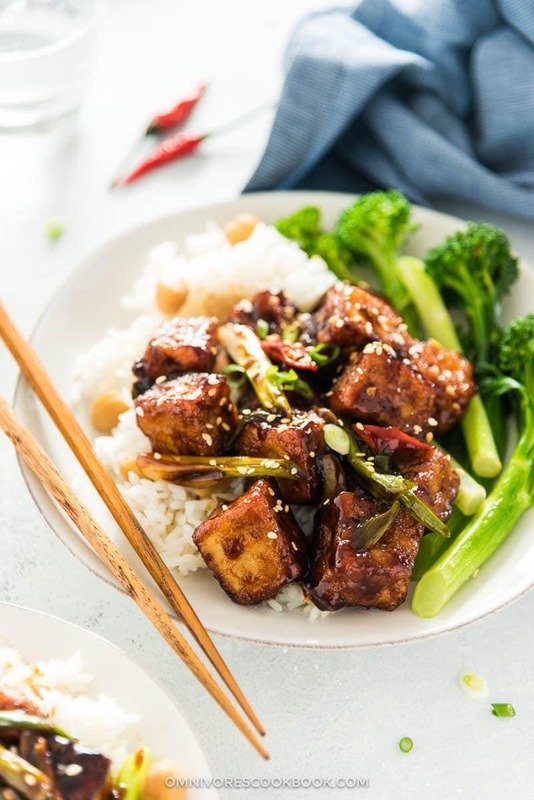 If you want to make your meal even healthier, use the method in my Sweet and Sour Tofu recipe to make crispy tofu without the cornstarch coating. This recipe is a part of the stir-fry sauce series, which shares tips and tricks on how to create a fresh and delicious dinner without any fuss. For example, in Week #1 I introduced Chinese orange sauce. You can use this sauce and the crispy tofu to cook a vegetarian version of orange chicken. If you like this General Tso sauce, check out this blog post of how to make the sauce in bulk. In that post I list all the options of vegetables that you can use with the General Tso sauce. 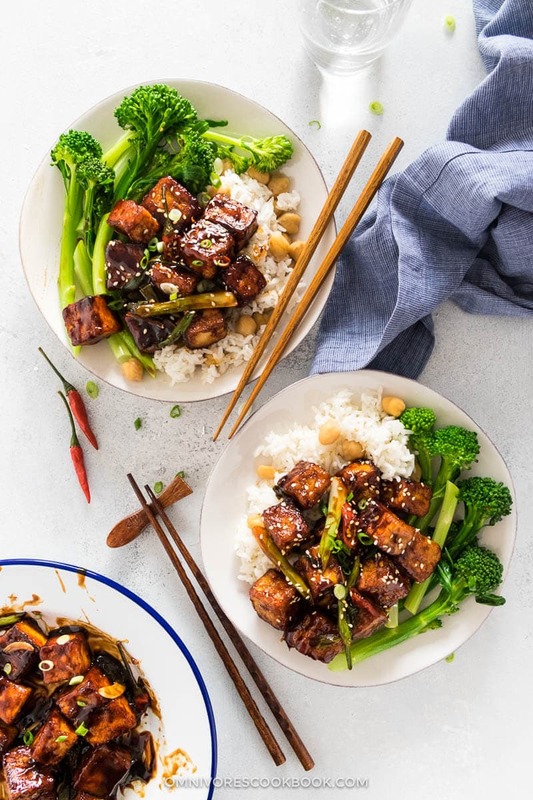 Not only you can change up the vegetables when you serve General Tso tofu, but you can even use the sauce to make roast vegetables. For example, to make General Tso’s cauliflower, you can roast cauliflower in the oven and then use the sauce in this recipe to finish the dish. Check out this post to learn how. I even include a method to roast crispy frozen cauliflower, which gets dinner ready in no time! Cut tofu into 1-inch pieces and transfer into a large ziploc bag. Add soy sauce and maple syrup. Gently flip the bag a few times to coat tofu with the liquid. Marinate for 10 to 15 minutes. Mix all the ingredients for the sauce. If you’re using pre-made General Tso’s Sauce, shake the sauce to let the cornstarch dissolve completely, pour 1/3 cup sauce into a bowl, add 1/3 cup stock, mix well. Prepare herbs for the stir fry. You could use a cheese grater to mince the ginger faster. For garlic, press a chef’s knife with your palm to crush it, so it’s easy to peel. Then use a garlic press to mince it. When the tofu is marinated, open the bag just a little bit without letting the tofu fall out. Drain all the liquid and discard. Add cornstarch, a tablespoon at a time, gently toss the bag to coat the tofu. It is OK if the tofu doesn’t coat evenly. Heat a large skillet with 1/2 tablespoon oil over medium heat until hot. Add broccolini (or broccoli). Sprinkle with salt and black pepper, stir a few times. Add 2 tablespoons water and cover immediately. Let steam for minute, until tender. Transfer the broccolini to serving plates. Wipe the pan with a few layers of paper towel if there is water left from the steaming. Add the rest of the 2 and 1/2 tablespoons oil into the pan. Add tofu with your hand (or a pair of tongs), shake off extra cornstarch. Let cook without moving for 1 to 2 minutes, or until the bottom turns golden. Flip to brown the other side. If the pan gets too hot, turn to medium or medium low heat. Transfer the cooked tofu into a plate. Set aside. Add back tofu. Gently toss to coat the sauce. Transfer everything onto the plate with the cooked broccolini. Serve as main with steamed rice or by itself. For gluten-free alternative, also avoid Chinkiang vinegar and Shaoxing wine, and use one of the substitution instead. You can still add one or two whole dried chili peppers and it won’t make the the dish too spicy. If you want spiciness, chop fresh chili peppers (or tear the dried chili peppers). If you give this recipe a try, let us know! Leave a comment, rate it once you’ve tried it, and take a picture and tag it @omnivorescookbook on Instagram! I’d love to see what you come up with. Had this,General Tao’s sauce on tofu & broccoli, as a side with Cantonese Pork Roast for our New Year’s dinner: excellent all the way around. It is comforting to know that these offered recipes are tested and found to be successful. As Maggie states, by making a bulk amount the cook has pre-made (fresh & healthy) sauce ready in the fridge for whatever veg is on hand. Please keep these great sauces coming and thanks. Happy cooking in the new year. … PS did I spell the General’s name wrong? No disrespect intended. how I do go on: without preservatives these sauces won’t keep for years … like the store bought. I’m sure Ms. Zhu can advise on shelf life. Hi Stuart, Happy New Year! I’m glad to hear you cooked the dish and enjoyed it! As for the sauce storage time, if you mix all the ingredients without adding herbs and simmering them, it can be kept in fridge for rather a long time (2 to 3 months). If you cooked a large quantity of sauce with herbs, it can be stored in fridge for 1 to 2 weeks. Wonderful recipe! Can’t wait to try it. Just a quick note though – my gluten-free friends tell me that Soy Sauce tends to have gluten as well. They usually opt for something else like Tamari or specially marked gluten-free soy sauce :). Hi Lisa, thanks for pointing it out. You’re totally right. You need to replace soy sauce with tamari (or other gluten free brand) for if you’re cooking for people who’s gluten intolerant. Wheat is one of the ingredients for making soy sauce, so most soy sauce contains gluten. I enjoyed this wonderful dish today, it’s so easy yet delicious. I used cime di rapa instead of broccoli and it also went very well. Hi Julia, I’m glad to hear you tried this dish and liked it! It’s so easy isn’t it? I just made this tonight, and it is fantastic! Thank you so much – I’ve tried many recipes for this, and this is by far the best. I made this for dinner last night, and I have to say it was one of the most divine eating experiences ever! Thank you for sharing!! Can the tofu be cooked without oil? Perhaps baked on s silpat? Looks amazing but I do not use added oil in my cooking. Thanks. It is a baked tofu without using oil. The result is a chewy-crispy texture that works well with a sauce (not as crispy as the method using oil though). Happy cooking and I hope this method is helpful. I just made this tonight for dinner. It’s good, the sauce is good, but I had trouble frying the tofu. When I was frying it, the cornstarch was goopy and stuck to the pan and came off of the tofu for the most part. In the end, the tofu was still sure, as if I didn’t fry it at all. This happens every time I try to fry tofu, I don’t know what the problem is. Is it that I’m adding too much or too little cornstarch? Or is my tofu too wet? Almost all of the marinating liquid absorbed into the tofu, so I didn’t even have to drain it. All I can say is this was super tasty, delicious and easy to make! My tofu didn’t crisp up as well as your’s, but no worries, it worked out in the end. This was my first time trying a recipe from your site; after the success I had with tofu, I quickly made your Thai Sweet Chili Chicken (also delicious – sent photos to my friends and everyone thought I’d ordered from a restaurant!) lol). Also, thank you for the tip regarding flash steaming veggies. My broccoli tasted exactly like the local takeout restaurant. I absolutely adore crispy tofu! I am bookmarking your website because there are so many tasty recipes here. Thank you Maggie! Really enjoying your recipes. Generally we do Chinese cooking with meat but today we ventured into the land of tofu! We thought this was a great set of ingredients to try it with because the coated what apppears to be a relatively bland base with flavour. Would certainly try it again because the tofu is so light. Thanks again for this site, I share it with many because the food is so quality!